At the J. 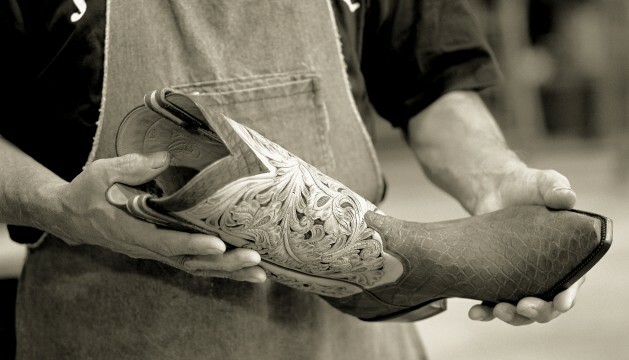 B. Hill Boot Company, we are dedicated to hand-making the finest custom cowboy boots in the world. We have assembled the finest craftsmen and deliver to them each morning only the highest grades of leather. At that point, we’re in their hands. A leather toe box is meticulously carved down to create a streamlined, classic look is only found on J. B. Hill custom cowboy boots. Experienced hands welt the boot using a little extra length to ensure the welt never breaks free. A minimum of thirty-six lemon wood pegs per side are used on all J. B. Hill Boots. This locks the insole and the outsole together insuring the steel shank will never twist. All leather stacked heels are cemented and nailed insuring integrity for the life of the boot. Each stitch on the welt is hand scored, creating a classic appearance. J. B. Hill engraved sterling silver conchos are inlayed and stitched to the leather pull straps. This subtle option provides a distinctive finishing touch.